Ecuador is best known for the Galapagos Islands but this tiny country is also a prime departure point to explore the Amazon. As part of our 3-week long trip in the South American state, we made sure to include a multi-day stay in the Ecuadorian Amazon. That one morning we left our ecolodge located on the Rio Cuyabeno and boarded our wooden canoes. Our destination was a traditional Siona village, deep in the Cuyabeno Wildlife Reserve. The Sionas are one of the numerous indigenous Amazon people, that also include the Secoya, Cofan, Shuar, Zaparo, Huaorani, and Kichwa. We went along the river for about two hours, slowing at every curve to absorb the scenery and checking for the elusive wildlife. We did spot some monkeys from afar, high above in the lianas, and numerous egrets and herons. Soon we landed in the tiny village made of a couple of thatched houses on stilts, small garden patches and kids running around. Our guide, a native of the same indigenous group, led us to one of the families. We met them working their field as the women pulled yucca out of the ground. It was impressive to see how big the yucca roots were, and how relatively easy it was to extract using a machete or a stick. After retrieving the roots, the trunk of the plant was set aside for later replanting. Also called manioc, this plant grew wild and was easily cultivated, making it a key staple of the indigenous population of the Amazon. Heavy with several large yuccas in hand, we accompanied the women towards their house. Up a few steps and onto a large open area that constituted their living quarters, more children and elders welcomed us. Our guest showed us out to clean and peel the roots. She then took a long wooden bowl, well a rather a canoe-shaped bowl. Using a makeshift shredder – a rectangular metal plate punched with multiple tiny holes – we proceeded to shred the yucca roots and get a rough wet paste. This was hard work as the shape of the utensils were unfamiliar and the volume of yuccas to prepare quite large. But on we went, and we managed to go through the load. Our arms were sour and painful at that stage! The difficult part was over. We now needed to extract as much liquid as we could from the wet paste. This was achieved by putting it into mats made of palm leaves, which we rolled and wrung several times. A milky water poured out the mat, and we kept at it until only drops would come down. The juice could be reused for preparing Chicha, a drink made of fermented yucca. The left-over mass was still tightly packed and our guest showed us how to sift it through a bamboo mat, to help break it down even further into a rough flour. We pushed and pushed it through until we finally had enough of this flour. This moist dough-like flour was then spread over a plate made of leaves, to give it a round shape like a crepe. No other ingredient was added, the starchy component helped keep the dough together. A metal pan had been heating over a hearth fire and was pretty hot. We were ready to cook and toast the crepe-like yucca bread. A few minutes on one side, a few more minutes on the other. Our yucca bread was ready! The traditional way to eat it is by tearing small pieces and dipping it in sauce or jam or anything else available. Since there is no salt or any other element, the taste was rather bland but dipping or mixing with another food was the way to eat it, served with vegetables or fish. After tasting our traditional homemade yucca bread, we walked through the rest of the village and by the river. Several kids were washing themselves and playing. Soon it was time to get aboard our canoes again and back to our camp for the evening. What a great experience this had been! Learning first hand from the Sionas how to use the local production and how to turn it into something edible, deep in the Amazon, was truly memorable. A must-do while in Ecuador! As the former Director of Content Marketing at Viator.com, I would recommend their Amazon tours. This is an affiliate link, which means we receive a percentage if you make a purchase using this link, at no additional cost to you. Our opinion is our own and is not impacted by this affiliate link. 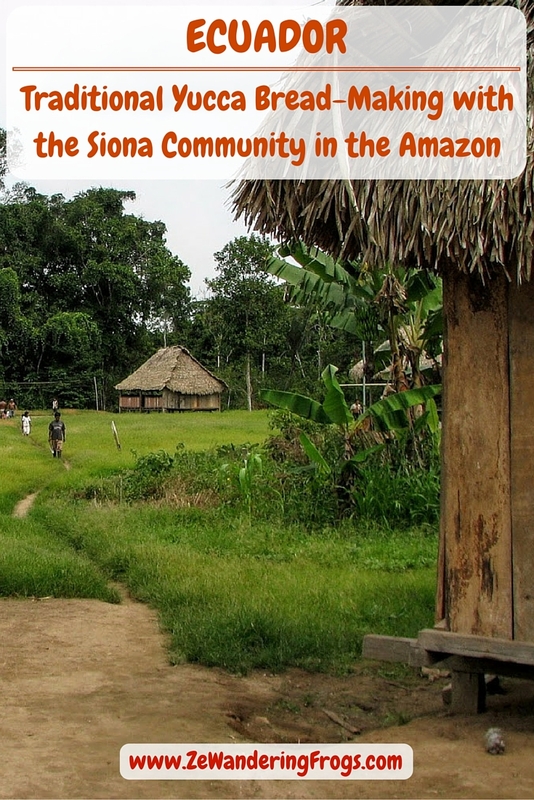 Today the Siona population is estimated at about 1,000 people, with about 500 spread around different communities in the Sucumbios, especially in upper Cuyabeno lakes, and another 500 across into Colombia. The word Siona is said to mean “Toward the Garden” (from sio = orchard, na = to in the Tucanoan language), possibly because the tribe was known to cultivate gardens. Their daily routine also includes traditional hunting and fishing. The Sionas in Ecuador refer themselves as the “Sa’niwi Bã” (Upriver people) as they do live in the upper sections of the Napo, Cuyabeno, Putumayo, and Aguarico rivers. Sometimes called the Siona-Secoya culture as they share many cultural similarities with the Secoya such as language and ancestry, the two groups are actually independent and live in different parts of the park. Historically, the Siona people, like the Cofán, lived in remote areas of the forest and survived based on the local subsistence of gardening, hunting, and fishing. The rubber boom of the late 19th- early 20th-century (1885-1945) led to the enslavement of many of the tribes, wiping out large numbers of indigenous people while the European settlements expanded. Further modern development that impacted the Sionas include oil drilling, water contamination, and deforestation of the rainforest. The deterioration of their environment, especially the rainforest, was a terrible part given how important lianas are for the Sionas, from medicine, food, poisons, ropes, rituals, baskets, etc. The affluence of the Spanish also reduced the practice of the native religion which was seen as diabolic by the Catholic Church. Today, the shamans are few apart, no longer wear the traditional Chusma or practice the Yage ceremony. The second largest reserve of the 45 national parks in Ecuador, the Reserve abounds with wildlife and biodiversity and is home to five indigenous groups. Several relatively big animals live there, from dolphins, manatees, capibaras, caymans, herons, monkeys, sloths, and more. The Cuyabeno Wildlife Reserve is relatively easy to reach, only a 30-minute flight from Quito to Lago Agrio, the entry point into the Amazon. The river can be accessed barely one hour and a half drive later, and within a few hours, one stands within the tall trees of the rainforest, relaxing by the river and taking in the fact that one is in the Amazon! This looks like such an incredible experience. I have yet to set foot in this part of the world but the more I read about unique experiences like this, the more I want to go! Visiting the Amazon tribes is an opening experience, and highly recommended. Isn’t it amazing how we figure out how to make something out of a plant. y peeling and shredding and reducing down to a flour, i’m always amazed at how foods are made. I’ve had yucca in Costa Rica, but but not as a bread. Sounds interesting. A far cry from shopping at the store for sure! And it makes you appreciate what you are eating and how you are eating it. A rewarding and humbling experience. You guys have the most fascinating experiences. And OMG, what a process but such a great way to immerse in culture. Sounds like a very special experience. I’ve been to Ecuador in the past and visited the Amazon but had never heard about this community. Thank you for sharing! This place looks so great and like a great get-away for a while. It seems people over there are much happier (and especially the chickens) than in many Western countries – I love how the kids smile and seem to enjoy life though they surely struggle for other reasons. Lovely to learn about the Sionas. Agree with that. Had a similar experience with kids in small villages in India! What an interesting experience! I’ll be honest, I had no idea what yucca bread was before reading your post. Now I’m totally down to try it! We did not either, until we went there. Learning something new everyday! We have been debating whether to experience the Amazon from Peru or Ecuador. I like how you can learn a lot about the local culture when you visit Siona Village. And the experience is very interactive which the kids will be sure to enjoy! Love Yuca, but don’t think I ever had Yuca Bread. Next time in Jackson Heights, I’ll look for it! So interesting! I’d love to stay in an eco-lodge. I had a couple of friends who did it in South America and really enjoyed it. It sounds like a great way to live like a local. A small setting is definitely the way to appreciate the Amazon, to feel closer to nature and the environment. Traditional ways of making things is so intriguing! How long does it have to cook over the fire for? And those little chicks roaming around is so cute! Looks like hard work, but how cool to get to experience it! I hope you got some Chicia for your efforts! I enjoy cultural posts. Nice one & quality pictures! What a great experience! Did you spend the night in the village? Are the villagers welcoming to strangers? I would love to visit the rainforest and meet the people who call it home. No, we did not stay in the village for the night, it would have been awesome! The villagers were very welcoming, and were keen on showing us their traditional way of life. I really enjoyed reading about your experience. This would be something I would be interested in doing as I like learning how other people live. Always give a great insight about the local culture. Your pictures of the children are so precious. Oh and I’d love to try Yucca Bread! Children made our day too, so friendly and genuine! What a fascinating and immersive way to experience the Amazon, sounds like a lot of fun as well as hard work. So did you get to try the chicha too? What a great experience! I’d love to visit a village like this. Lovely post, thanks for sharing. We always try to visit local villages whenever we can, these are such an eye opening to discovering the local culture. Agree, one can share and learn a lot around food, sharing and understanding our differences and becoming richer from it. So, is it like a flatbread? I was trying to tell from your pictures! It sounds yummy. It is pretty flat and thin, a bit like a crepe. Totally worth trying!